I find I go through phases with handheld gaming where sometimes I play a lot and other times I can go for months without it. With the peculiar launch of the 3DS - complete with immediate price drop - I thought it was too expensive for what it was offering. The 3D was interesting, but didn't engage me and I found it more of a novelty than a must-have. But I did like the 3DS game library! The Nintendo 2DS was a perfect price point to lure me in. Being compatible with the prior DS library and the current 3DS games, I was excited to get the 2DS. Some have complained about the size and lack of screen protection, but I find it a more comfortable size when it comes to holding it and gaming. The smaller footprint of the clam-shell design was more difficult to hold for long period of time. The Nintendo 2DS is a handheld game console developed by Nintendo. Announced in August 2013, the console released in North America, Europe, Australia and New Zealand on October 12, 2013. The Nintendo 2DS is an entry-level version of the Nintendo 3DS which maintains compatibility with software designed for the Nintendo DS and 3DS, but uses a new slate-like design rather than the clamshell design used by its precursors and lacks the Nintendo 3DS's signature auto-stereoscopic 3D functionality. Upon its unveiling, reception of the Nintendo 2DS was mixed, particularly regarding the design of the device which some reviewers felt was less appealing than that of the 3DS with some, however, commenting that it felt more robust. The Nintendo 2DS console is sold concurrently with the other models of the Nintendo 3DS family as an incentive to expand the market for Nintendo 3DS games. It is intended for a different audience than the 3DS, in particular children younger than seven years old, which are not recommended to the use the 3DS's 3D functionality. Nintendo have stated, however, that 3D will remain a part of their future plans. Various publications praised its pricing and form-factor, but also criticized the console's poor aesthetics, sound quality and battery life. Nintendo officially unveiled the Nintendo 2DS on August 28, 2013 via a press release; members of the press were given a chance to demo the device in private prior to the announcement. According to Nintendo of America president Reggie Fils-Aime, the Nintendo 2DS is primarily aimed at a younger demographic than the Nintendo 3DS - particularly, those younger than 7 years old; whom Nintendo had advised not to use the 3D features on the 3DS due to potential eye health concerns (although the validity of Nintendo's claims were questioned by vision experts, and considered to possibly be for liability reasons). Nintendo aimed to produce a device that would be "new, unique, different, and bring more people into this category that we love." Part of this goal was achieved by positioning the device at a lower price point than the 3DS; in North America, the system retails at US$129.99, in comparison to the US$169.99 price of the standard 3DS. As part of a promotional effort for Nintendo's late-2013 releases, the Nintendo 2DS, was featured on The Nintendo Experience promotional tour on Simon Malls locations in the United States throughout October and into early November, and The Nintendo Holiday Mall Experience tour, which is planned to happen from mid- November through December on 23 United States malls. The Nintendo 2DS was released in North America, Europe and Australia on October 12, 2013, the same day as Pokémon X and Y. In North America, it was available in both Black + Red and Black + Blue color variations, while in Europe and Australia it was available in White + Red and Black + Blue. Each console is bundled with a 4 GB SD card. Unlike the Nintendo 3DS XL, the 2DS comes bundled with an AC adapter. Despite the release of the Nintendo 2DS, other members of the Nintendo 3DS family, including the Nintendo 3DS and 3DS XL, will be sold alongside it. Unlike the first two Nintendo 3DS models, no Japanese release for the 2DS has been announced. The Nintendo 2DS's hardware specifications are almost identical to those of the Nintendo 3DS; retaining features such as its GPU, CPU and memory, along with compatibility with games designed for the Nintendo DS and Nintendo 3DS. However, its hardware still contains some slight differences. Unlike the Nintendo 3DS, which uses two display panels, with a lower touchscreen panel and a top dual-layered screen panel capable of displaying glasses-free stereoscopic 3D, the Nintendo 2DS uses a single display touch panel (with the illusion of two screens formed by an overlay template, the top half's surface is covered by clear plastic protector and the bottom half by the digitizer) and thus has no such 3D capabilities. Despite its inability to display 3D content, the 2DS retains the 3DS's dual cameras for taking photographs in 3D which can be seen in 3D when they are viewed on a Nintendo 3DS or any other 3D-enabled device. The Nintendo 2DS only has an internal mono speaker, as opposed to the internal stereo speakers of the 3DS, although stereo sound can still be outputted through the headphone jack, as well as pseudo-surround sound. The Nintendo 2DS's design is a significant departure from that of its precursors; while it is roughly the same size as its counterpart, the 2DS uses a "slate-like" form factor instead of the clamshell form used by the Nintendo DS and Nintendo 3DS. Its buttons are positioned towards the center of the device instead of near the lower screen, and its shoulder buttons are concave in shape and relatively thicker than those of the 3DS. In lieu of closing the shell, the 2DS uses a dedicated switch to activate sleep mode and the hardware Wi-Fi switch from the 3DS has been removed and replaced with a software toggle. The Nintendo 2DS contains the same 1300mAh battery present on regular Nintendo 3DS systems. Despite not supporting the 3DS's Power Save Mode (which dynamically adjusts the screens' backlight based off screen contents) the 2DS has a slightly better battery life than the Nintendo 3DS. Nintendo rated the 2DS as being able to play from 3 to 5.5 hours of 3DS games or 5 to 9 hours of DS games on a single charge. Official carrying cases for the Nintendo 2DS were released simultaneously with the system's launch. The cases were made in order to improve portability of the system, due to the lack of hinges on the 2DS unlike previous Nintendo 3DS and DS systems, and to prevent the 2DS's screens from scratches whilst carrying the system. They were made available in both red and blue, to coincide with the system's colors. The Nintendo 2DS is compatible with all Nintendo 3DS software and online services powered by Nintendo Network, such as StreetPass and SpotPass. Similarly to the Nintendo 3DS, the Nintendo 2DS uses the Home Menu as its graphical user interface. It is used to launch software stored on game cards, applications installed on a SD card, and DSiWare titles installed in the system's internal memory. Users can access this menu by pressing the Home button and suspend an opened application, and access the following multitasking applications: Game Notes (to write and save notes), Friend List, Notifications, Internet Browser, Miiverse (an integrated communication system and social networking service), and Camera (a lightweight version of the Nintendo 3DS Camera app with most features omitted). The system also comes pre-installed with various applications such as: Nintendo 3DS Camera, a photo and video recorder with a media gallery and photo editing functionality; Nintendo 3DS Sound, a music player and sound recorder; Nintendo eShop, an online distribution store; Nintendo Video and streaming video services such as Netflix, Hulu Plus and YouTube; a messaging application called Swapnote (known as Nintendo Letter Box in Europe and Australia); Mii Maker, which allows users to create digital avatars called Miis; and Activity Log, which keeps a record of which games have been played and for how long, as well as counting steps taken while carrying the console, using its built in pedometer. Other Nintendo 2DS system applications include Nintendo Zone, a built-in application that detects and makes use of certified Wi-Fi hotspots; and StreetPass Mii Plaza, an application in which players meet other players' Miis over StreetPass and online, and interact with them. All Nintendo 3DS games and applications are compatible with the Nintendo 2DS, albeit in 2D mode. Retail copies of games are supplied on proprietary Nintendo 3DS Game Card cartridges, while downloadable games are available on the Nintendo eShop. The Virtual Console service, which allows users to download and play games originally released on older systems, is also compatible with the Nintendo 2DS. The console also retains features such as augmented reality and Download Play, which allows users to play local multiplayer with only one copy of a game. In addition to Nintendo 3DS software, the Nintendo 2DS is backward compatible with most Nintendo DS and Nintendo DSi software. The console is region locked (software purchased in a region can be only played on that region's hardware). The Nintendo 2DS received mixed reception upon its announcement. Kotaku felt that the Nintendo 2DS might appeal to a certain niche of people who otherwise would not purchase a Nintendo 3DS, and that the lack of 3D support could indicate a cooling interest in stereoscopic graphics. USA Today noted that some games that were designed with 3D in mind might not be as easily playable without the stereoscopic feature. CNET, meanwhile, called the console an acknowledgement by Nintendo that 3D was an unnecessary feature and even a "tactical mistake". NBC News called the 2DS a "peculiar choice" to gamers satisfied with the Nintendo DS line, and feared that it might take resources away from the less successful Nintendo console, the Wii U. Some technology writers have expressed concern with the physical appearance of the 2DS: CNET called the console a lot uglier than its other models, while TechCrunch called it "hideous". The publication went on to express concern that the form factor didn't seem very practical, especially to children with tiny hands. However, some reviewers have generally found it to be comfortable in the hand. USA Today referred to it as "surprisingly comfortable". Kotaku noted that while it may look bulky, it was pleasant to hold even with one hand. It also noted that buttons on the unit were easily accessible, and that their placement on the upper half of the console directs the eye toward the upper screen. Overall, the publication felt that the build quality was good. GamesIndustry also described the controls as considerably more comfortable than that of its predecessors. It also noted that the console had thick shell rather than the thin Nintendo 3DS, and that the lack of a hinge added durability. The publication felt that the design resembled "an unholy union of a Game Boy, the Wii U GamePad, and a Nintendo DS." USA Today and CNET both had some concern over how to protect the screens, since there is no clamshell to close. In response to reports that the 2DS used only one physical display divided to emulate two, Kyle Orland of Ars Technica believed that Nintendo had missed an opportunity to produce a full-screen gaming tablet using the 2DS's form factor; which would have enabled future games and apps to use the entire screen area (which he estimated to be around the 5-inch range used by phablets), still allow backwards compatibility with games designed for the folding 3DS and DS, and enhance the ability to port existing smartphone games to the platform. However, Orland also noted that introducing such a product could fragment Nintendo's portable gaming ecosystem for existing 3DS users - and that it was too early in the 3DS's life for Nintendo to introduce a successor. TechCrunch called the console a gaming tablet, though it noted that Nintendo games are more expensive than those on mobile devices. However, Kotaku felt that the screen was small in comparison with that of the Nintendo 3DS XL, with less screen real estate than other portable electronics such as competing portable game consoles and gaming tablets. The Nintendo 2DS received mixed reviews. While pricing and form-factor were generally considered ideal, the console's aesthetics and battery life were widely criticized. The Telegraph noted that the lack of hinges in the console improved its robustness, and that rounding out the footprint makes it an ideal handheld for children. However, the publication criticized the console's mono speaker, which offered a lower sound quality than its predecessors. It also criticized the battery life, which it described as being the same as the original 3DS model. On the other hand, it praised the screens' brighter display and wider viewing angle, despite their not being as large as those of the 3DS XL. Eurogamer reinforced the idea that the Nintendo 2DS isn't aimed at "seasoned players" or current Nintendo 3DS owners, and felt that the system wasn't produce with aesthetics in mind. The publication also criticized the resistive touchscreen, which felt outdated, the mono speaker and battery life. 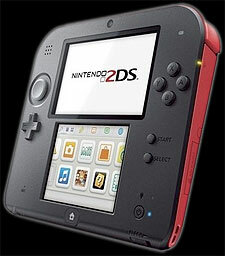 However, Eurogamer felt that the system is much more comfortable to hold than the Nintendo 3DS and 3DS XL. Analyst Piers Harding-Rolls felt that the Nintendo 2DS would help Nintendo broaden its market, and believes that third-party publishers will have more commitment to the platform moving forward. Following the systems launch, Nintendo stated that the release of Sonic Lost World would boost Nintendo 2DS sales, labeling it as a "must play" title. On October 31, 2013, Nintendo president Satoru Iwata admitted that the Nintendo 2DS lacked awareness among prospective purchasers. Additionally, he went on to say that some potential consumers believed that the product was too large and heavy to carry. However, Iwata stated that the system was well received among those who had purchased it. Despite the 2DS's lack of 3D support, Satoru Iwata insisted, during Nintendo's 2013 third quarter investors Q&A, that the company "will not abandon 3D or cease to make new propositions in 3D", as it will continue to sell existing the Nintendo 3DS and 3DS XL platforms. However, The Legend of Zelda: A Link Between Worlds producer Eiji Aonuma revealed in an interview that the game had suffered minor changes in development due to the lack of 3D on the 2DS. Sales of the Nintendo 2DS surged three weeks after launching in the United Kingdom, after retailers cut on its price due to poor sales. The system was available for around £110, but major retailers including Argos, Amazon and Tesco cut the system's price to under £100 to coincide with the school half-term. As a result, sales of the Nintendo 2DS shot up 64 per cent week-on-week, making it UK's best selling console of the month, without combining the sales of the Nintendo 3DS and 3DS XL models. During the third quarter of 2013, video game retailer giant GameStop reported that worldwide hardware sales grew by 15.3%, mainly due to strong Nintendo 2DS and 3DS sales. On November 29, 2013, Nintendo of France deputy general manager Philippe Lavoué announced that the Nintendo 2DS had sold approximately 645.000 units in France since launch, which accounts for approximately 30% of total Nintendo 3DS family sales in the region.